I'm very proud of Mikey - he's started a Warhammer after-school club, and it's proving quite popular with with his friends. Of course, we've already had some minor plastic casualties and even a lost template, and then he came home and said we need to donate stuff to the club! First off: Bought some eBay dice and templates and branded them with the school name. Second off: No figures - I insisted, as they get stolen, broken and can only be used by one person at a time. Terrain, then - making it is cheap, not too time consuming, and you can get great results really quickly. Here goes with "scratchbuilding on a budget 101"
I had in mind an industrial tower with a drain hole and somewhere to shoot from on top. Decent cover with a good line of sight vantage point. I didn't make any paper plans, which may or may not be its undoing. "Measure twice, cut once" is not relevant here. I made the base from a test piece of MDF I was working on to learn how to use my new scroll saw and router. It's a (very) rough kidney-bean shape with some grooves in it. The grooves aren't important - just leftovers from me not mastering the router. I cut the Actimel pot in half and removed the label. This will be a drain spout. Next, I marked out and cut a basic circle into the side of the coffee can. This doesn't have to be neat - once I inserted the yogurt pot, I filled the edges with Squadron Green putty. This not only fills the gaps, but fixes the pot in place. 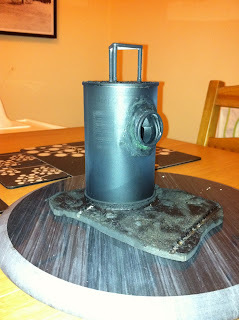 I glued the coffee can lid upside-down to the base with 2-part epoxy and superglued the can to it. 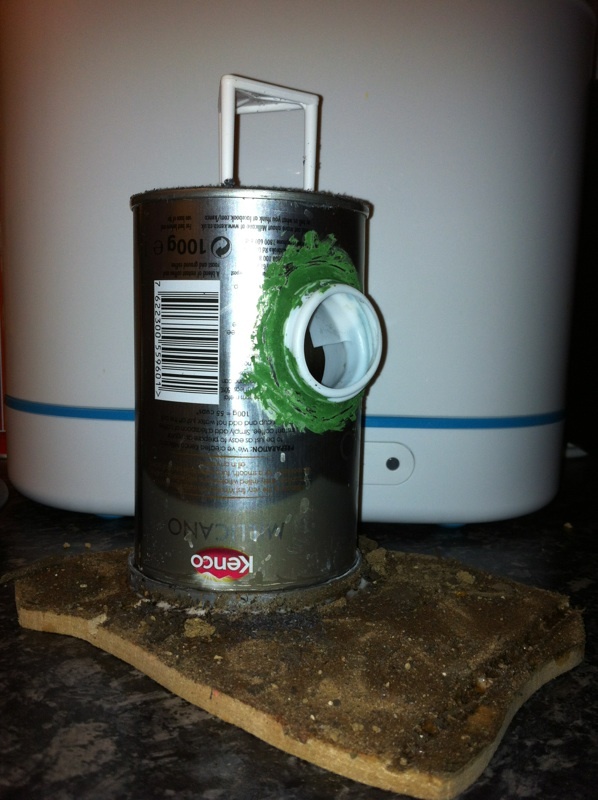 PVA glue covered the MDF and based it with sand/compost Also PVA'd the top (bottom actually) of the can, and then poured black railway scatter. The pizza box spacer is fixed with putty. 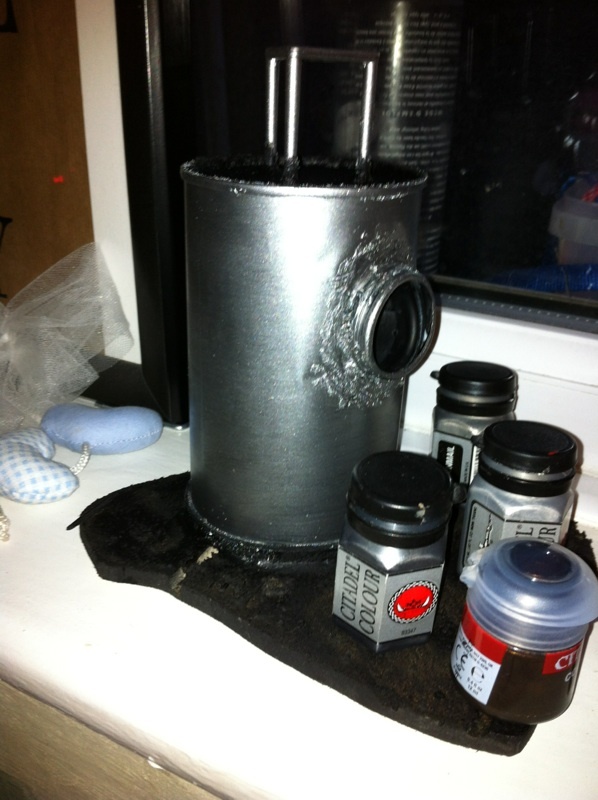 It's black primer - honest! A few details I'm yet to source - wire mesh to cover the pizza spacer, something for a ladder, barbed wire and other greebles to break up the coffee can. Paint-wise - lots of ooze, rust, rain stains, mud and faded signage - although I don't know what this is yet. Is it Orky, Imperial or generic industrial? What's its purpose? If this is successful, I'll build some more industrial terrain from Pringles tubes and other household recycling. Bring on the Christmas snacks!